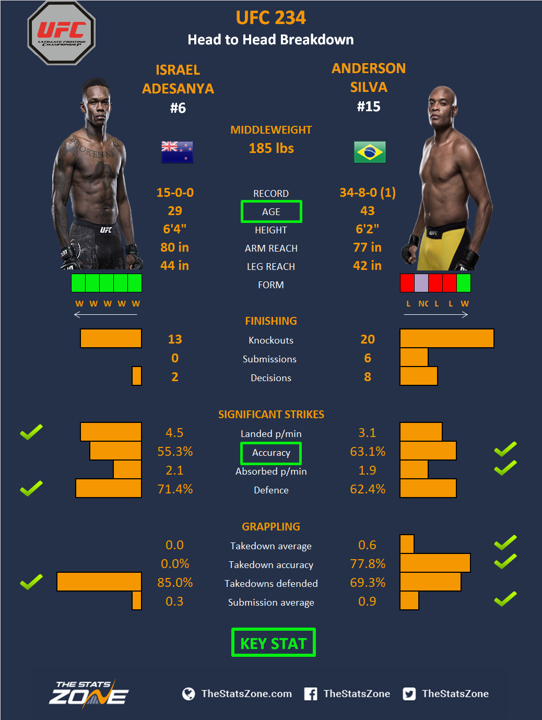 What a mouth-watering co-main event we have for UFC 234 as we see the return of one of the best fighters of all time, Anderson Silva, the most dominant middleweight champion of all time and one of the most mesmerizing strikers we have ever seen in the octagon. It is only fitting that he has been matched-up with a younger version of himself. Israel Adesanya is an electrifying prospect with an unbeaten record. ‘The Last Stylebender’ is a highly accomplished Kickboxer who has climbed the UFC ranks by putting on spectacular performances. None more so than in his last fight against Derek Brunson. Adesanya put a lot of pressure on himself to deliver a knockout after a lot of bad blood but he thrived and made the knockout look easy. This performance was like seeing Silva in his prime, and although his last fight was also a win over Brunson he has struggled to find his vintage form for years. Don’t expect this fight to be fireworks as both are counter-strikers and we could see a prolonged feeling out process. That said, it will still be an intriguing and intense contest. Nobody would bet against a prime Silva, but those days are long gone and Adesanya is only just starting to peak. He has the youth, speed and technique to land on the Brazilian but he must not underestimate him. Silva may not be as quick, but he will still be hard to hit with a constant counter threat. The key factor is that Adesanya is a student of the game. He has followed Silva through his whole career and carefully scrutinized every aspect of his technique, whereas Silva may be more ignorant of his younger adversary’s skills.